Iraq observed the first of three days of mourning for at least 213 people killed in a massive Baghdad truck bombing claimed by the Islamic State of Iraq and Levant (ISIL) group. With anger rising that government protection was not strong enough to deter the single deadliest bombing in over a decade of war and insurgency, Baghdad announced the execution of five convicted “terrorists” on July 4 and said it had arrested 40 other militants. The grim search continued for bodies at the devastated shopping mall in the upmarket Karrada district which was targeted early on July 3 as it filled with shoppers ahead of the Eid al-Fitr holiday marking the end of the Muslim fasting month of Ramadan. Prime Minister Haider al-Abadi announced efforts to address longstanding security flaws in Baghdad following the blast, which came a week after Iraqi forces recaptured the city of Fallujah from ISIL. Security and medical officials said the number of dead from the attack has risen to at least 213, with more than 200 wounded. The ministry also said that security forces had arrested “40 terrorists” who it said were linked to planned attacks during Ramadan. In Karrada, young men dug through the ashes using shovels and their hands, searching for those still missing after the blast. Black banners bearing the names of victims — including multiple members of some families — hung from burned buildings, announcing the dates and locations of their funerals. Abadi was met with an angry response when he visited the site on July 3, with one video showing men throwing rocks and shoes at what was said to be the premier’s convoy. 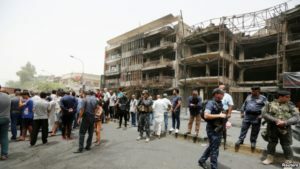 IS claimed the attack in a statement saying it was carried out as part of “ongoing security operations.” The group appeared to be making the point that it still has the ability to strike devastating blows against Iraqi civilians after even after suffering military setbacks like the one in Fallujah. With thousands of vehicles moving in and out of the capital each day, such bombings are difficult to prevent. But there are also flaws in city’s security measures, especially the use of fake bomb detectors at checkpoints years after the man who sold them to Iraq was jailed for fraud in Britain. Abadi said he was scrapping the fake detectors in a series of security changes he announced on July 4. He also ordered faster installation of scanning devices at entrances to Baghdad, a ban on security personnel using mobile phones at checkpoints, and increased aerial reconnaissance and coordination among security forces.